Chilling and strange WWII photo in my possesion. Need answers. Discussion in 'Information Requests' started by Schella, Dec 31, 2007. Hello, I came across this original photo in a flee market outside Halifax, Nova Scotia a few years ago. The man that I bought it from said he got it from a family from Lunenburg, which is close to Halifax and contains a lot of families of German descent. The photo has perplexed me and many that I have shown it to over the years and now I show all of you on this forum this weird photo. I still don't know if it is fake or real, but from the people I have talked to at my university in the photo department say it is authentic and from the period of the war. I am a 26 year old Canadian and I have no WWII experience except the stories and history I have read and my grandfathers stories, but besides that I have exhausted all my knowledge I can on this photo. Some things over the years I have come across about this odd and chilling photo. -it seems staged... The situation is almost too visceral. And it seems that the German is possibly persuading the Russian to surrender? -The photo itself is authentically from the period, but this can be reproduced. -Some have suggested it is in the Balkans due to the soil and trees, and Russian/German trench standoff. -The soldiers weapons seems to be switched, the Russian seems to have a German smg, where the German seems to have a Russian PPSH. -The chipped bark on the trees seems to be consistent with ordnance exchanges in that terrain. -If you look closely at the Russians hand you can clearly see where he had a ring on and took it off and the skin that was covered by the ring is lighter as would happen with dirt or sun tan. -On the far middle right of the photo it looks like a German Jack boot is just off the end of the photo also blurred as if in movement, so perhaps this was a trench charge that caught this cameraman and soldier together with this unfortunate Russian. I have higher resolution images of this photo if requested. Link to the full size image. Here is a better touched up and amplified close-up image of the boot/foot on the right. That is too good of a quality shot to be original....my opinion. Hard to tell. Too many questions. Interesting photo though. A German and Russian soldier? It just doesn't look "right" to me. Wrong colors, etc. I would have thought it would be more "sepia" in appearance, if that makes sense. Im pretty sure the Russian has a PPSH-43? It's a nice photo, but I have to agree that something just isn't right. It seems a little staged to me, maybe a German in a Russian uniform!? Just an idea. More interested about the trees..
Hope you don't mind, just attaching the picture so I can view it overall on a single screen. Nothing wrong with the tone for a 1940's image & both using Russian weapons, which would be fair enough. Almost looks like a print from a film frame. whether contemporary propaganda or postwar entertainment could be a tricksy business. Is there any manufacturers mark printed on the reverse of the paper? What is the surface of the paper like? Very Glossy or completely matt? of the paper or is it 'deeper' and bonded within the grain of the paper. (If the paper has grain or texture, if it doesn't at all then that in itself would be mildly suspicious). On the back of the photo there is something but it was marked out with black marker. I have tried to see what was marked out but with no luck. The surface is glossy and the back is somewhat smooth white paper. So it is not matted in anyway, it is clearly by touching it smooth and glossy. The photo goes to the edge of the paper and is large itself. The photo is about 9.5" X 12.5" it is just a littler larger than a piece of loose leaf. I have some suggest it was a film still, but from what film? I remember someone saying it could be from the 70's film "Cross of Iron". I have yet been able to see that movie. For the last question I would say that the photo is not bonded with the rest of the paper but seems to "sit" on the top of the paper. It also looks like you could peel off the photo from the back of the paper, not easily of course but the corners are pulled up a bit from age. From your description it sounds very much like a modern print. Though that, of course, proves nothing about the source of the original negative. It is reminiscent of Cross of Iron, & this is pure speculation but that Russian just looks American to me. Here is a close up of the "Russian". I have no basis for this, but I suspect that the photo is a still from a film. The fact that the German has a Russian weapon is odd, and I can't imagine a battlefield photographer taking a photo under such obvious duress and still capturing his subject (the russian) in perfect focus. Mind you if this is a WWII era photo, there is no such thing as an auto-focus, so this is no small feat. I'd imagine that if this was a live scenario the bullets started flying shortly after the photo was taken. One item that I noticed but I'm not sure is significant is the rope hanging from the tree on the right. I've attached a cut out section of the rope. Could it be that the two men are from the same squad and they are simply guarding each other's back as the rest of the squad crosses the trench? I find it hard to believe a photographer could get a shot off before either one of the soldiers holding an autmatice weapon facing their enemy could. 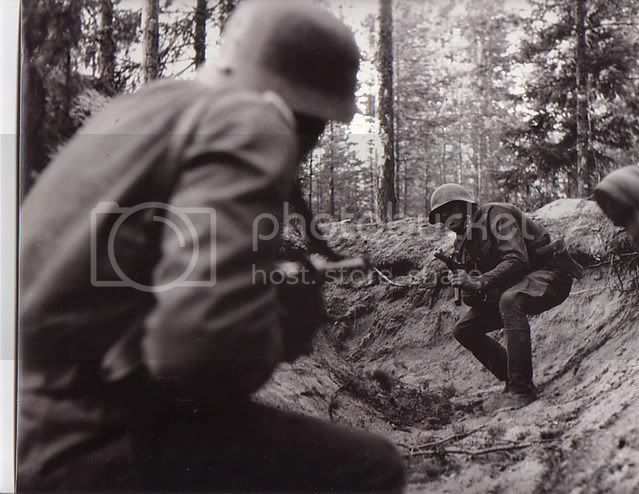 The Russian has the disadvantage as he must have jumped into the trench or come from behind the corner.So he has not got the German in his sights earlier than he is in the German´s sights. So by now, if a true situation, the Russian would be dead already. And where are his comrades? I would not go hunting alone..
Its probably movie or staged. Theres to much against it. Does the picture ring any bells among all the new members this year? I think it might be staged aswell, because the Germans made alot of ''fake'' photographs of Soviets in WWII. I remember seeing a few with a Soviet soldier taking cover next to a German Panzer, ''Soviet'' soldiers surrendering while wearing GERMAN helmets, parts of uniforms and/or weapons. It might be propaganda, because I also feel that something is wrong especially with the Soviet soldier. Well it doesn't ring a bell with me, should it? The "Russian" does look very American. But what I find strange is that no one who participates in a forward counter or defense combat would use his weapon with the strap slung around his neck. How would the Russian move his gun if needed to the right? or forward left? the strap also is far too tight. What you should be thinking now is, The Russian is facing the German, the camerman who would have had to get the camera to his eye, check out the shot for a micro second then depress the shutter, is standing just to the right hand side of the german, within the cone of fire of the russians gun, and he is about to pull the trigger, well would YOU stand there to take the photo, I am ruddy well sure I wouldnt, surely that says its posed with no threat of anybody getting hurt.